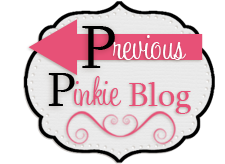 Thank you for joining us on another Pinkies Blog Hop! We're showcasing lots of gorgeous projects using new Stampin' Up!® products from the new Spring/Summer catalogue. Simply use the buttons at the end of each post to keep hopping! 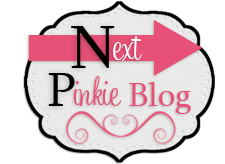 Now is the time of year when many brides are making those all important finishing touches to their wedding plans and the project I want to share with you today would be perfect for a wedding or christening. It features several of the new gold themed products from the catalogue. 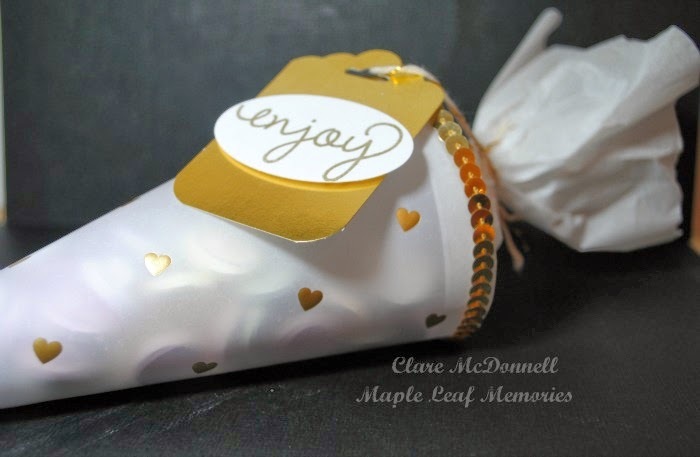 I used the gorgeous heart embossed Fancy Foil Designer Vellum to form a cone then topped it with some tissue paper from the Celebration add-on kit on page 30 of the catalogue. I disguised the join between the vellum and the tissue with some Gold Sequin Trim.I filled the cone with some Love Hearts before tying with Gold Bakers Twine before adding a matching tag. To make the tag I punched a tag from some of the Gold Foil Sheet using the Scalloped Tag Topper Punch, the sentiment is from the Simply Celebrate stampset - don't you just love the font? Hi Clare, I love the idea! Looking great! Great idea, love the gold! What a great idea! Great project!